Irish Distillers, has today announced the launch of a new addition to its Spot range of whiskeys. 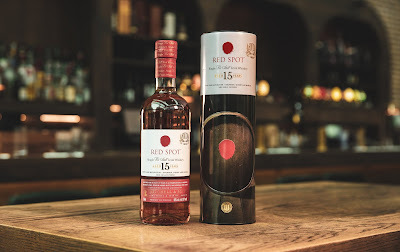 Red Spot Single Pot Still Irish Whiskey 15 Year Old (46% ABV) has been matured for a minimum of 15 years in a combination of casks pre-seasoned with Bourbon, Oloroso sherry and Marsala fortified wine. Last seen in the mid-1960s, and crafted from an old recipe handed down by the Mitchell & Son family of wine merchants, the creators of the original Spot Whiskeys range in the early 1900s, the reimagined Red Spot is said to have a full-bodied, complex and characterful flavour profile that will appeal to aficionados looking for a bold whiskey experience. The Mitchell family worked closely with the Midleton Distillery throughout the collaboration. As part of the process, Marsala fortified wine casks were procured from Sicily in the early 2000s and then in 2004, were filled with a five-year-old Bourbon matured single pot still Irish whiskey. The subtle contribution from the tight grain of the American oak was the ideal base for the heavy spice and ripe fruit flavours imparted through maturation in Marsala wine casks, which has been carefully blended with ex-Bourbon and ex-Sherry whiskeys to achieve the perfect balance of flavour. The Red Spot name was derived from the Mitchell’s practice of marking their maturing casks of whiskey with a daub of coloured paint to determine the age potential of the whiskey; with a Blue Spot, Green Spot, Yellow Spot or Red Spot indicating 7, 10, 12 or 15 years respectively. Red Spot Single Pot Still Irish Whiskey 15 Year Old, will be available later this month in Ireland, before rolling out to the UK, Europe, US and Global Travel Retail early next year. RRP €115,00.